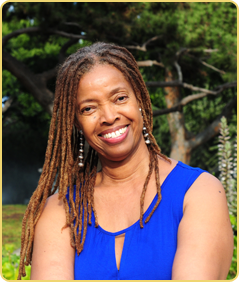 Dr. Kamala Easton is a spiritual teacher and powerful motivational speaker whose forte is addressing topics that are both spiritual and practical. Since 1998, she has been traveling the world giving inspirational talks on such topics as spiritual transformation, living an enlightened life, moving from lack to wealth and abundance and embodying the wisdom represented in the Indian Goddesses Lakshmi and Kali. Her energetic presence is particularly strong when speaking to large audiences as she did when she gave the keynote address at the US Consulate Chennai India for International Women’s Day. Whether she is speaking to large groups or small ones, all of her talks feature her trademark sense of humor and down-to-earth wisdom that make her an audience favorite. Among the many venues in which Kamala has presented are Santa Fe Center for Spiritual Living, Santa Fe Community College, National Youth Leadership Forum on Medicine held at UCLA Medical Center, American Educational Research Association in San Francisco, and Unity Church in Cedar Rapids, Iowa. In addition, Kamala has presented her Goddess Workshops and spoken at many yoga studios and yoga festivals around the country. Kamala has a Ph.D. in education, with a focus on motivation, which she earned from UCLA. She spent twenty years in academia. She traveled and lived in India for nine years and owned an energy-healing practice in Malibu, California. Kamala has appeared on PBS and Discovery Channel and was a member of UCLA Medical Center’s Complementary Medicine Pediatric Pain Program. In 2012, she published her first book, Autobiography of a Yogini: A Black Woman’s Love Affair With Her Guru. She is currently working on a second book, Embodying Spirit: The Journey Towards Enlightenment. The new book is based on an eight-month online course she offers by the same name that helps people find their own Divine Wisdom using eight principles of spiritual transformation.